This topic provides descriptions of the rock types appearing on the British Geological Survey 1:625 000 scale map of the UK South and gives a brief explanation of their origins. Carboniferous rocks crop out southwards from the Scottish border through the Pennines and into the Midlands, in Wales, and in the south-west peninsula. Perhaps more than any other geological system, this is the unit that has been plundered for our economic development providing the materials that fuelled the Industrial Revolution of the 18th and 19th centuries — coal, iron, refractory clay, limestone, building stone and water. Hematite has been mined from the limestone of the Lake District, lead, zinc and fluorspar from Derbyshire and elsewhere, and on the Great Orme’s Head in north Wales copper mining has been traced back to the Bronze age, some 3000 to 4000 years BC. In more recent times, the Carboniferous has been the focus for hydrocarbon exploration. This history of economic interest and investigation has given us a good understanding of these strata and a vast amount of information, but also more confusing sets of local nomenclature than any of the other geological periods. In early Carboniferous times, Britain lay just to the south of the Equator but drifted to a few degrees north (2º to 8º) during the remainder of the period. The climate was hot, humid and wet — similar to a modern tropical rainforest — with a somewhat drier climate at the beginning and end of the period. Late Devonian and early Carboniferous sedimentation patterns were controlled by blocks and basins (Figure P785817), developed within a larger depositional basin that extended from Ireland, eastwards through north Wales, northern and central England (where it is known as the Pennine Basin), to the North Sea and beyond. The Southern Upland Massif formed the northern boundary of the Pennine Basin, the Wales–Brabant High separated it from an ocean that covered the southern part of Britain, and where deposition was more or less continuous throughout the Devonian and early Carboniferous (Figures P785818, P785819 and P785820). Carboniferous blocks and basins. P785817. Carboniferous palaeogeographical sketch maps - Early Visean. P785818. Carboniferous palaeogeographical sketch maps - Early Namurian. P785819. Carboniferous palaeogeographical sketch maps - Early Westphalian. P785820. The blocks were characterised by relatively thin and incomplete sedimentary successions, and some are supported by granite at depth (for example the Askrigg and Alston blocks). The basins, or depocentres, include the Solway–Northumberland, Stainmore, Cleveland and Craven basins (where over 4000m of strata are preserved), with the Culm Basin to the south. Subsidence continued as a result of rifting that persisted from late Devonian into late Visean times, and at the same time the basins were largely infilled with sediments so that thick and relatively complete sedimentary sequences are preserved. Local volcanism was associated, in particular, with the early rifting phase and lavas and tuffs were erupted both on land and on to the sea bed. Rifting declined in the later part of the Visean but crustal extension or regional (thermal) sag continued. In Britain the main divisions of the Carboniferous are Tournaisian, Visean, Namurian, Westphalian and Stephanian. These equate broadly with the older terms Carboniferous Limestone (Tournaisian/Visean), Millstone Grit (Namurian) and Coal Measures (Westphalian). Stephanian strata have only a restricted occurrence in England and Wales. Sedimentation began at different times on the various blocks and in the basins: for example in the Craven Basin, south Wales and Culm Basin, strata of Tournaisian age are exposed, but in Derbyshire and north Wales the oldest reliably dated strata are of early Visean age. Cyclicity is the dominant feature of Carboniferous sedimentation and repeating patterns can be seen in all the major divisions. Cyclic sedimentation may be induced by global events, such as change in sea level (eustatic oscillations) associated with the growth and melting of ice sheets, or may be related to local tectonism, such as that associated with contemporary fault movements in the Tournaisian. In distributaries and on the interfluves of large river deltas, cyclic successions of sand and mud developed when channels silted up and rivers were forced to find another outlet. These overbank and channel deposits together with alluvial fan and possibly some lacustrine beds form the ‘continental facies’, which is a major part of the early Carboniferous Ravenstonedale Group (C1) of the Askrigg Block and Stainmore Trough. However, the earliest Carboniferous succession is characterised by its limestones, deposited on geographically isolated blocks (Carboniferous Limestone Supergroup; C2). Carbonate accumulated in warm shallow shelf seas on platform, ramp and slope areas — forming bioclastic limestone rich in crinoid, shell and coral remains. Modern equivalents may be found in the reefs of the Bahamas. Periodically, parts of the blocks were above sea level and subjected to erosion or to the formation of karst. These shallow-water platform carbonates form the dramatic scarps and cliffs of the Yorkshire Dales — Gordale Scar, Malham Cove and Malham Tarn (Great Scar Limestone Group) — and in Derbyshire (Peak Limestone Group) around Buxton (Plate P005586, P006263 and P006254). In north Wales, the Clwyd Limestone Group forms the escarpment that trends south from Halkyn Mountain to Llangollen and the cliffs of the Great Orme’s Head. The Pembroke Limestone Group crops out in south Wales and the Mendips, where it rests on the Avon Group in which the bioclastic limestones are interleaved with dark mudstones. Typical limestone country: Middle Craven fault-scarp in the Malham Formation, North Yorkshire. P005586. Apron reef facies at the edge of the Derbyshire Block with shelf limestone at the left and Namurian shales in the centre ground resting unconformably on the limestone. P006263. Woo Dale Limestone at Drabber Tor, Wolfscote Dale Derbyshire; well-bedded calcarenite. P006254. Deeper water carbonates, commonly deposited as turbidites, are interbedded with hemipelagic mud in the basins. As the Craven Basin subsided the Tournaisian platform carbonates (Bowland High Limestone of the Bowland High Group) were buried beneath carbonate and siliclastic turbidite and mud of the Craven Group (C3). 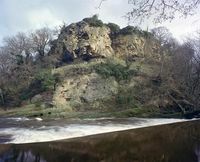 In the Culm Basin of the south-west, carbonate turbidites of the Teign Valley Group (C1–4; lower part of the Culm Supergroup) were derived from the north and silicic turbidites from the south. Volcanic rocks of early Carboniferous age are common in the south-west, and were extruded along major rift faults. The Tintagel Volcanic Formation (Ctf) includes tuff, agglomerate and lava (C) typical of rapidly chilled submarine magma. Penecontemporaneous deposits of radiolarian chert with interbedded mafic lava and tuff comprise the Teign Chert Formation (part of the Teign Valley Group; C1–4), which also includes manganiferous strata-bound ores. In the Midlands, mafic lavas and tuffs were erupted on the Derbyshire High and in the adjacent marine basin, and are preserved within the Peak Limestone Group (C2). 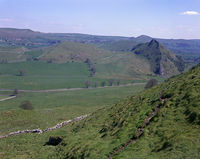 Basalts of the Cockermouth Lavas (Clv) underlie the Great Scar Limestone (C2) north-west of the Lake District. In the Solway–Northumberland and Tweed basins of the north, a river system that drained a large hinterland laid down mud, sand and carbonate as fluvial, alluvial fan and lacustrine deposits of the Ravenstonedale and Inverclyde groups (C1), during the Tournaisian when the climate was relatively arid. Deltas built out as far south as the Askrigg Block during the late Visean to Namurian, with cyclic successions deposited as the Yoredale Group (Figure P785819). 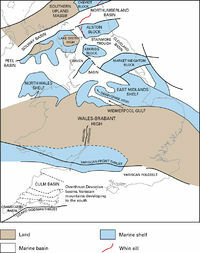 The Yoredale facies, typically with limestone, mudstone, sandstone, seatearth, ganister and coal, was deposited in low-lying alluvial and deltaic flats that were subject to regular marine incursion and accumulation of carbonate. The Yoredale Group is divided into three main formations on the relative proportions of the main lithologies, mudstone, sandstone and limestone. The Tyne Limestone Formation (C2) is a heterogeneous mix of these lithologies and occurs only on the North Sheet around Bellingham. Limestone dominates the Alston Formation (C3), which includes the Great Limestone Member, a thick bioclastic limestone that forms a prominent feature in Cumbria and the northern Pennines. The Stainmore Formation (C4) comprises more equal proportions of mudstone, sandstone and limestone, with several chert horizons. At the end of Visean times, glacio-eustatic sea level changes and the input of vast quantities of deltaic sediments wiped out the great carbonate reefs although cyclic deltaic and fluvial deposition continued during the Namurian. 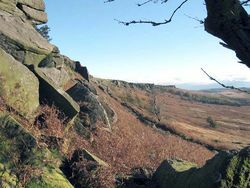 In the central Pennine Basin individual sandstones of the Millstone Grit Group (C4) form impressive crags that stretch for many kilometres, for example the Chatsworth Grit of Stanage Edge and of Millstone Edge itself (Plates P667860 and P667861). Thin coals are preserved in the Namurian sequence (Plate P005755). 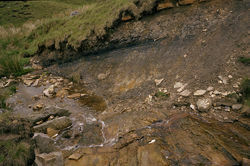 Marine incursions are represented by black mudstone rather than the limestone that is typical of the Yoredale Group. Facies equivalent to the Millstone Grit also occur to the south of the Wales–Brabant High. The Namurian Marros Group consists of locally derived quartzose sandstone, and crops out across south Wales and into the Bristol area. The Holsworthy Group (C5–7) of south-west England was deposited as turbidite lobes on a delta front, and is similar to the lower part of the Millstone Grit of the Pennine Basin. By Westphalian times, southern Britain had evolved into a landscape of rivers and lakes, lush equatorial forests and peat mires, and low-lying regions were periodically inundated by the sea. The Westphalian cyclic successions consist of sandstone, siltstone and mudstone with subordinate seatearth (palaeosol), coal and ironstone. The mudstone is grey, characteristically carbonaceous and fissile, with fossil plants and nonmarine bivalves. Marine mudstone bands are less common than in the Namurian but have been important in correlation across the different basins and are used to define the Lower, Middle and Upper Coal Measures. Coal is the compressed remains of forest and mire, and some individual seams may be traced over a very wide area. Ironstone occurs as thin beds or nodules of iron carbonate or siderite, and originated as the chemical deposits of fluctuating groundwater within the palaeosols. The sandstones usually show ripple lamination, cross-bedding and a variable mineralogy that has proved useful for determining the source of the sediments. The Pennine Coal Measures Group is preserved in the coalfields of central England. A maximum thickness of about 1900m is found near Manchester. Initially, the sediments of the Pennine Basin were sourced from river systems flowing from the north, continuing the pattern that was established during the Namurian. However with time, parts of the basin received fluvial sediment from other sources, first from the west and then from the south-east. The South Wales Coal Measures Group (C5, C6, C7), extends across south Wales and eastwards into the Bristol–Somerset area and thence, in the subsurface, to Oxfordshire and Kent. Delta lobes and fluvial sand spread southward from the Wales–Brabant High, and coarse pebbly sands formed as shoreline sand bodies. The youngest Carboniferous beds are dominated by a red-bed facies that developed during late Westphalian to Stephanian times. The red coloration is due to iron oxidation, and coals are sparse in this facies. This is the Warwickshire Group (C8; formerly Barren Measures), which is found particularly on the margins of the Pennine Basin, for example in the West Midlands and in north Wales, and also near Kirkby Lonsdale. South of the Wales–Brabant High at this time, rivers flowing from the Variscan mountain belt that was developing to the south spread sediment across much of south Wales and the southern part of England, and wetland forest flourished on these alluvial plains. These sandstone-dominated successions with thick coals are identified as the Pennant Sandstone Formation (C7) that forms the characteristic plateau of the South Wales Coalfield (Plate P209677) and occurs also in the Bristol–Somerset Coalfield and in the concealed Oxfordshire–Berkshire Coalfield. Calcrete palaeosols (caliche) are more abundant in the younger strata, an indication that the climate was drier during the late Westphalian and Stephanian. 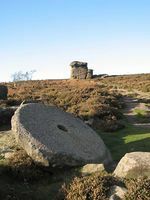 An abondoned millstone at Millstone Edge, Derbyshire. P667861. Namurian sandstone: the Chatsworth Grit at Stanage Edge. P667860. Natural outcrop of coal and seatearth, Cowsen Gill, Forest of Bowland, west of Settle. P005755. The Pennant Sandstone forms the plateau above Cwmparc, Rhondda. 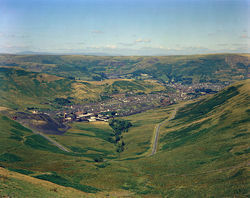 Abandoned coal diggings and quarries can still be seen on the hillside in this photograph taken in 1961. P209677. Kaolinite-rich seatearths (fireclays) and tonsteins (kaolinite mudstone) that occur within the Westphalian strata are thought to have originated as volcanic ash. Volcanic and intrusive rocks are also recorded within the Pennine Coal Measures and mafic sills seriously reduced productivity of the Asfordby coal mine near Melton Mowbray, one of the last collieries to be developed, in the late 20th century. The coal seams were oxidised and died out in the vicinity of the igneous rocks where fractures also allowed water into the mine. 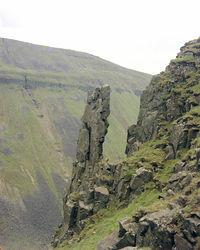 Whin Sill forms this pinnacle on north side of High Cup Gill. P007523. The Variscan tectonic cycle began in late Devonian times, and was driven by the closure of the Rhenohercynian Ocean that lay to the south of Avalonia/Laurentia, separating it from Gondwana. At the end of the Variscan cycle, the supercontinent of Pangaea had been formed. Unconformity at the base of the Permian limestone where is overlies Namurian Plompton Grit, Newsome Bridge Quarry, Knaresborough. The unconformity surface is reddened by weathering and in places a breccia of Carboniferous sandstone fragments has been preserved. P222619. Regional deformation migrated northwards, and can be tracked by the age of the metamorphism of the slates. Deformation was instigated by continental collision in the late Devonian–early Carboniferous, which caused overthrusting of the oceanic crust that forms the Lizard ophiolite and Start Point Complex. 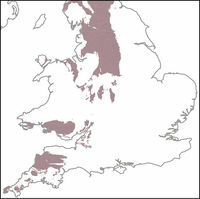 By Visean times it had spread to north Cornwall and Devon (345 to 325Ma). Movement on the original extensional faults that had controlled basin subsidence was reversed and the normal faults became thrusts with large folds developing above them, eventually leading to uplift and deformation of the Culm Basin during the Westphalian. Large-scale thrusting and overfolding in southern Britain marked the final phase of the Variscan Orogeny in latest Carboniferous and early Permian times. The Variscan Front Thrust (Figure P785817), which represents the northern limit of pervasive Variscan deformation and metamorphism in southern England, occurs broadly along the southern flank of the Wales–Brabant High. On the Variscan Foreland the Wales–Brabant High remained relatively stable, but north of this early Variscan movement resulted in block and basin rifting. This crustal tension was followed in the late Visean by regional subsidence, which continued during the Namurian and Westphalian, and the rift topography was progressively buried beneath quantities of sediment carried into the basin from the north and south. Granite tor, Carn Kenidjack, Carnyorth Common, Cornwall. [http://geoscenic.bgs.ac.uk/asset-bank/action/quickSearch?keywords=P006066&newSearch=true&quickSearch=true P006066. The final phase of Variscan movement caused basin inversions on the Variscan Foreland with a period of uplift and erosion (Plate P222619); earlier unconformities within the upper Carboniferous succession of northern and central England show the progressive nature of the Variscan inversion. The severity of basin deformation varied markedly from basin to basin; locally, as in the Ribblesdale Fold Belt, which forms the inverted core of the Craven Basin, several thousand metres of strata were removed by erosion. Volcanic eruption and intrusions occurred intermittently throughout the Carboniferous, controlled by tension in the continental lithosphere. These igneous rocks are generally basaltic (mafic) in composition, and some of the intrusions are closely associated with the volcanic rocks (lavas Clv and tuff Ctf). The Whin Sill Complex (CP), dated at 295Ma (late Carboniferous), forms a discontinuous scarp across the landscape of northern England as well as other eye-catching landmarks, for example High Cup Gill west of Middleton in Teesdale (Plate P007523). The Romans used it as the foundation for part of Hadrian’s Wall. However, the most conspicuous intrusions of this cycle are the granites (felsic) of Devon and Cornwall (Plate P006066). 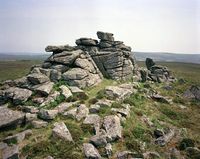 The Bodmin (CP) and Dartmoor (D) granites are part of a largely concealed batholith that stretches some 250km from the Isles of Scilly to near Exeter, and may be up to 20km thick under Dartmoor. The batholith is associated with metamorphism and mineralisation that includes tin, copper, lead, zinc, arsenic, silver and gold. This major body was emplaced at the end of the Variscan orogeny, and dates from about 300 to 270Ma (late Carboniferous to early Permian). This page was last modified on 28 July 2015, at 17:07.